AFL: Former No.1 draft pick Lachie Whitfield is expected to be rushed straight back into the Giants side to play Collingwood on Saturday following his contentious six-month suspension by the AFL. Whitfield will return to the side for the crucial Collingwood clash despite not having played at any level in 2017, while the Giants are set to retain the struggling former Geelong great Steve Johnson for the game. Whitfield's has been unable to participate in the opening eight rounds due to his suspension by the AFL for staying at the home of a then GWS official in an apparent attempt to avoid a prospective drug test. His suspension ended this week. But the talented young midfielder has been training exceptionally well and with Greater Western Sydney coping with a series of injuries to key players, the Giants are understood to have decided to pick him for the game against Collingwood, which beat GWS in the corresponding game in Sydney last year and has never lost to the Giants. Johnson, meanwhile, is set to be retained for the Magpies clash in the face of scrutiny of his form and concern about his capacity to apply pressure in the GWS forward line. 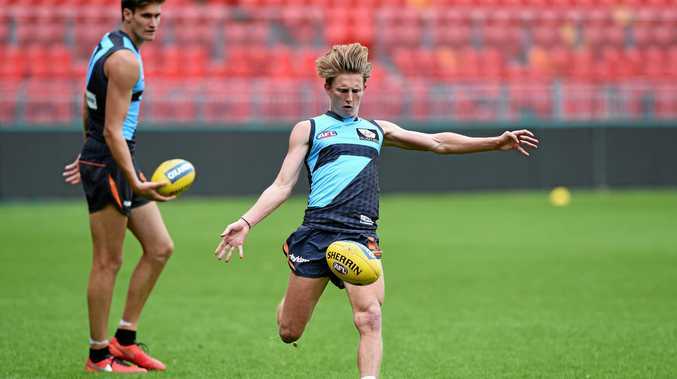 It's a weakness that the club has acknowledged as a concern this year, given that it has three tall forwards - Rory Lobb, Jeremy Cameron and Jonathan Patton - who are not renowned for chasing and applying pressure, in addition to the veteran Johnson. Collingwood, facing a desperate situation at 2-5, will regain silky midfielder Daniel Wells who was rested from the disastrous loss to Carlton last Saturday because of doubts that he could play for a third time in 12 days. GWS hopes to regain former Tiger gun Brett Deledio after the mid-season bye. Deledio has been battling a persistent calf problem that has prevented him from playing at all in 2017 following his trade last October. GWS is still without the suspended Toby Greene, Ryan Griffen, Nick Haynes plus Deledio, Jacob Hopper and Matt Buntine, with Stephen Coniglio having resumed last week. Whitfield was suspended after he stayed overnight at welfare manager Craig Lambert's home in 2015 in an apparent attempt to avoid a drug test. Following an AFL investigation that also involved ASADA, Whitfield was suspended while Lambert and former football boss Graeme Allan were also outed for 12 months. The investigation came after Whitfield's then-girlfriend emailed ASADA with allegations.